Artist Mario Cassar is taking his art to the people via a number of workshops taking place in Valletta. Joseph Agius writes about the vision behind the project. Mario Cassar’s interest in Augusto Boal, the Brazilian theatre director and originator of The Theatre of the Oppressed, is indicative of the Gozitan artist’s vision of transporting the artist’s studio from Malta’s sister island to the streets of Valletta. 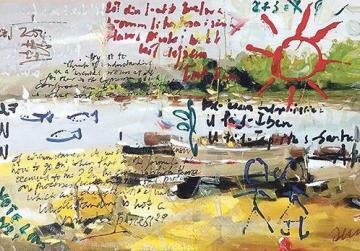 He is doing this via a number of ongoing workshops, aptly titled Valletta Creative Workshops. This project is an intra-genre enterprise that allows for the interaction of many art forms into one cohesive whole. Drawing, painting, photography, performance art, sculpture, theatre and architecture are the ingredients of a conceptual recipe that does not adhere to strict rules. Cassar’s profession as an art teacher merges with his ideas as a conceptual artist. The Valletta Creative Workshops are his playground, whereby he proposes different approaches via an intradisciplinary ‘licence’ that does away with constraints and preconceptions. The same format is followed for every workshop, which includes a lecture linked to a particular theme and its relevance to contemporary artists; the research of ideas via photography, sketching and painting; a performance; and a final session of drawing or painting or photography. Each workshop sees the actual representation of a particular theme executed by the participants, following their active involvement in performance art and discussions. Universal themes such as death, spirituality, the body itself and the concept of time were each devoted one workshop. In one of the workshops, Caravaggio’s Beheading of St John was re-enacted as a tableau vivant in a manner that evokes Jeff Wall’s work. The Canadian artist is known for his A Sudden Gust of Wind (after Hokusai), an interpretation of Hokusai’s Yejiri Station, Province of Suruga, involving actors. Similarly, in the above-mentioned workshop Cassar borrowed an art historical masterpiece – which is, incidentally, Caravaggio’s theatrical and pathos-laden interpretation of an episode in The New Testament – as his template. He then directed his students in an impromptu theatrical representation. The photographical documentation of this performance, bearing the palindromic title QatraartaQ, suggesting blood droplets, is an artwork on its own merits. The workshop saw Cassar searching for a new narrative and interpretation of the Caravaggio masterpiece through the bodies of the participants. This crossover from one art form into another is the Duchampian ethos of the Gozitan artist, who firmly believes that the concept is more important than the actual work. The rich architecture of the Maltese capital, its sacred spaces, and their relation to the human body provided subject matter for another workshop. Cassar urged the participants to explore the physical and mental limitations of their bodies – something which Marina Abramovic excels in during her rather self-conscious performances. In this democratisation of art, Cassar perceives our capital city itself as a gallery in which the conventional four walls of masonry have collapsed. The audience is a steady trail of humanity, rather than the usual select half per cent of the population that consciously walks to and enters the confined space of a museum or a gallery. In his epic novel Of Time and the River, Thomas Wolfe perceived the movement of people within a huge metropolis like New York City as a dark mass, moving around at all times of the day and night as a cohesive whole. Within the local Maltese context, the diminutive size and the built fabric of Valletta mitigates the deluge of a river-like humanity. This was conducive to Cassar’s search for an alternative audience – one that is unwittingly drawn to the discussion or performance just a few metres away. Cassar’s academic grounding – first as a fine arts student at the Gozo School of Art, and later as a history of art student at the University of Malta – was followed by his postgraduate studies that increased his knowledge of contemporary art theory, studio practices and pedagogies. His first exhibition, held in the late 1990s, demonstrated his awareness of the international and controversial end of the millennium art scene – particularly the one in the United Kingdom, besides the one in Germany. In 1997, London’s Royal Academy hosted a collective exhibition by the name of Sensation. This exhibition of new British art was as controversial as it was epoch making. All of this was intriguing to the then young Gozitan artist, as it introduced him to a new way of doing art in which the concept was of paramount importance. Cassar’s 1999 monochromatic Meta il-Konkos Isir Alla followed shortly after. The work is a comment on the readiness of political parties to bend over backwards to assuage the needs of a building industry that has cannibalistically destroyed our endemic fabric and quality of life. The transcendental spirit of Anselm Kiefer can be felt in this particular piece, where the high rise reaches towards a heaven that worships greed and money as its new gods. That said, Cassar did not rest on his academic laurels. Through art journals, magazines and travel, he kept abreast of what was happening in the global contemporary art world and was aware of who was breaking new ground. By the year 2006, his vision had transformed itself, and his art followed suit. His Master’s degree in art education, which he started in 2008, increased his determination to break the mould. The symbols, text and scribbles of Cy Twombly, as well as the Apokatastasis of Malta’s own Josef Kalleya, found their way into Cassar’s iconography. This is how Cassar’s art communicates via a language that is apparently indecipherable and mysterious. Untitled (Fish) and Untitled (When the Sun Shone) are two important examples. As in the case of Twombly, one needs to peel away the layers to get at a syntax that this proto-calligraphy propagates. Mark’s Prayer (2012) displays a Warhol signature Brillo box juxtapoed with a photographic portrait of a famous Maltese politician, Dom Mintoff. This nod towards Warhol’s world cannot be coincidental, as the detergent box acts like a seal of confirmation. The colours are bleached out of the photograph - the passage of time has mellowed the memory of the colourful heydays of this Maltese pop culture icon. Perhaps the contents of the Brillo box have done their job and eased out the colour of the prejudice of history. Cassar exhibited this work as an altarpiece in an installation that included votive candles – which are customary in shrines. It is an ironic comment on the level of hero worship that plagues a country in which a political leader overthrows any Saint. Especially after his death, this new god becomes worthy of adoration and adulation. ‘Mark’, the name in the title of the piece, is just an anonymous member of this congregation of worshippers who pray daily to invoke the effigy’s help for divine intervention. Icon (2012) is yet another dig at an icon of Maltese national pride – the island’s independence from Great Britain. The monochromatic repetition of an iconic moment, that which depicts George Borg Olivier proudly waving the document decreeing the end of centuries of foreign rule, is etched in the Maltese history books via photographic documentation. The repetition of the image, while eliminating every other human element in the actual photograph, empirically reduces an important historical moment to a mere flashback featuring the two main protagonists of the memory: a euphoric Maltese prime minister, and a sheaf of papers that declared the independence of a tiny island nation. Cassar’s The Cabinet of Curiosities (2017) evokes Joseph Cornell’s famous accumulation of unrelated artefacts into a ‘memory box’ or as a ‘poetic theatre’, where the box hints at an enclosed space. This worked for Cornell as a creation of an alternative surrealistic space which poetically narrates a story in the spirit of automatic writing. Cassar’s is an actual cabinet with drawers displaying symbols of alchemy. Nettle, hurried notes, a depiction of a sundial and a sketch of some medieval castle are like clues or ingredients of some archaic recipe. The closed drawer could harbour the elixir of life itself. Similarly, in The Cabinet of Curiosities, Cassar incorporated a childlike graffiti and barely decipherable text into the work. Both hint at some sort of storyboard of evanescent childhood memories. This collection of disparate objects is surrealistically intriguing, like a puzzle. This particular work evokes Andre Breton’s thoughts that “the mind, placed before any kind of difficulty, can find an ideal outlet in the absurd. Accommodation to the absurd readmits adults to the mysterious realm inhabited by children”. Categorising Cassar simply as a conceptual artist might be reductive, considering the very heterogeneous and vast output of the Gozitan artist. He is one who does not rest on his laurels and is, as was Duchamp, “interested in ideas, not merely in visual products”.